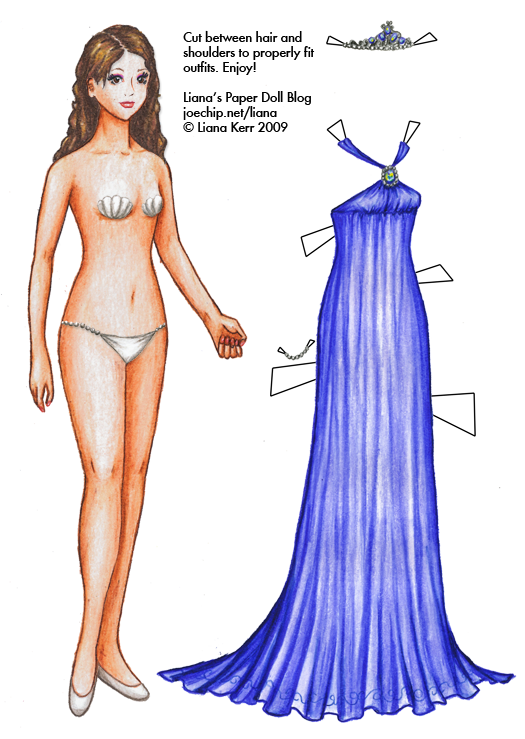 Click for larger version with gown (PNG); click for PDF version with gown. Click for larger version without gown (PNG); click for PDF version without gown. I like her a lot, and I hope you all do too. I look forwards to making her many lovely outfits! YAAAY!!! Great job!! I LOVE IT!! so you arnt going to make any more clothes for Ivy and Slyvia? a new doll ~ how wonderful! it’s so good to see you posting again! I think she is beautiful, I really like her gown and tierra. I am SO GLAD you’re back! I’ve missed your paperdolls! Glad to hear about the new scanner, new toys are always fun to have around. I really like new Ivy here–kind of random, but I think her “bra” with the shells is fun. I’ve wanted a bra like that since I saw “The Little Mermaid” when I was a kid. How fun to have a new paper doll. I like her seashell bra, too and it means you don’t have to draw around it (very smart). Paper doll underwear design is an art all it’s own. Both doll and the dress are beautiful. And I agree with everyone that seashell bra is a very good idea. Thanks everyone! I’m glad Ivy is getting off to a popular start in life. Paper doll underwear design really is a bit of a pill, I look back at the mermaids and can see a bunch of times where I had to do some really kludgy working around the base bra shape, so hopefully this should be a little more fun. I considered just leaving it off, Barbie-style, but… I couldn’t just expose Ivy to the whole internet like that! Barbie can forget her underwear because she has not natural body parts. I like Ivy, and I’m glad you’re back! Excuse me, I meant “no” natural body parts, although they are also “not” natural! hi love your new paper doll she is awsome. i’d have to say she is my favorite out of all the paper dolls! i can’t wait to see all her outfits. I love your dolls! I was wondering if you have plans for a little girl? I plan to make your dolls for my daughter and laminate them as her stocking stuffer. Thank you so much! Oh, and I was thinking it that since this doll is bald, it might be fun to put her out that way and do wigs! Just a thought! Wow. I love your designs and dolls Liana. They are awesome. And maybe you could do tutorials on how to draw the dresses. That would mean the world to me. she is the only paper doll i have on your blog! some times when i see the other clothes for the other paper dolls I wonder if you love them more then Ivy! this is a cool doll i love it i think it would be cool to make a young man doll for weding pairs and stuff like that. i also think that liana should read the book -The Princess of Glass- cause there are lots of dresses described in it and it would be cool to see your version of the peacock mascquerade dress! hi liana would aprecciate if you drew a new doll like iris but with different hair?